With only one returning sophomore on the roster, the Cowley College women's cross country team has added several talented runners to its squad. New head coach Dan Adler has been busy adding quality runners to the program. Adler's hard work appears to have paid off as he signed 10 freshmen to the 2016 roster. "I'm really excited about the potential of this special group of young ladies," Adler said. "To succeed in this sport, one must get out of their comfort zone and discover incredible inner strength." Sophomore Kayla Gourley is the lone holdover from last season's team. Gourley gained a great deal of experience and placed 83rd at last year's Region VI Championships. Fellow sophomore Courtney Griffiths joins the cross country squad after spending the 2016 outdoor season as a member of the Lady Tiger track and field team. During the outdoor track season, Griffiths was chosen as the Female Track Athlete of the meet at the Region VI/Jayhawk Conference Outdoor Championships after winning the 800-meter run and 1,500-meter run. “She will use the cross country season to become an even stronger track athlete for us,” Adler said. Highlighting the list of incoming recruits are Anytcy Marin of Fredericksburg (TX) High School and Naomi Similus from Oakridge High School in Orlando, FL where she was an Orlando All-Metro Selection. Rylie McConnell and Cassidy Cummings, who helped Parkway High School in Bossier Springs, LA capture the 5A state cross country title last season will also be expected to make immediate impacts. While Kansas recruit Skyler Blakely of Atchison High School competed in track and cross country and will be a nice addition to the squad. 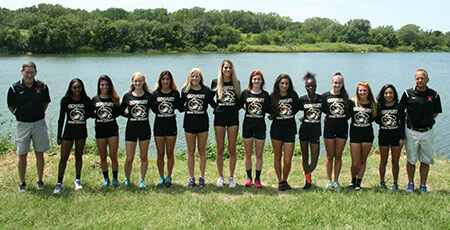 Cowley also added Texas runners Danielle Davidson of Midlothian High School and Anton High School's Jessica Sosa. Like Anytcy Marin, Maria Vargas also comes to Cowley from Florida where she was a successful runner at Barron Collier High School in Naples, FL. Other out of staters are Kaitlyn TerBush of Reese High School in Michigan, and Zavannah Brown of Carrollton High School (GA). "We have ladies coming in from six different states: that's a true testament to their willingness to step outside of their geographic comfort zone to help take Cowley cross country to the level this community expects," Adler said. The runners on the team have enjoyed pushing each other to improve and are excited to see where they stack up against other teams in the region. The Lady Tigers will open the season Friday, August 26 at the Allen Red Devil Duals in Iola, KS.